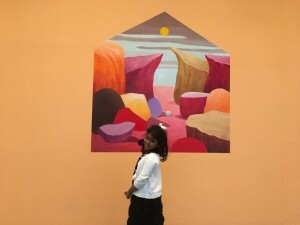 Hirshhorn Museum : Washington DC has a number of really excellent museums – all world class and most of them completely free. 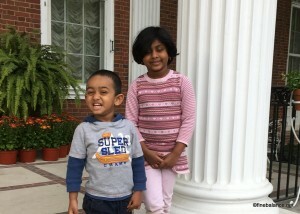 Despite our wish to see all of them, we tend to go to Washington DC primarily when we have guests. And then we take them to the two most visited museums, the Air and Space Museum and the Museum of Natural History. These are great museums but now we have been slowly badmouthing these museums to our guests and suggesting that they visit some other museum. Most folks are clever enough to not fall for our trick but my cousin really didn’t care enough about museums and let us lead us into Hirshhorn Museum and Sculpture Garden. Now we entered the museum not knowing anything about anything about contemporary art. Right at the door, we were met with a young docent who was giving a free guided tour of the main exhibit , so we decided to take advantage of it. While waiting for the tour to start we took a stroll in the gardens to look at the various sculptures they have. 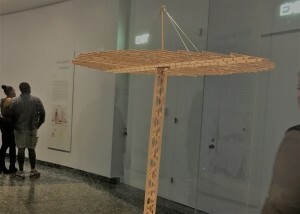 The exhibit that was featured were works by Ilya and Emilia kabakov-Russian born American sculpture artists. Our young guide was trying to explain to us the major themes of their work whicn revolved around freedom, hope and the pursuit to escape Communism. The guide aspired to be a teacher because he was good at asking us the right questions to get us to the answer he was looking for. Thanks to his efforts, we appeared to be getting the message. 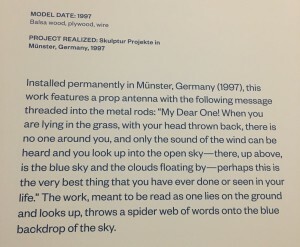 It was all going really well, till we reached one of their final works – a small antenna – which was a miniature representation of one of their larger installations. “What do you see when you look here”, asked the guide. “An antenna”, we chorused. Like all good teachers, he was quick to praise. “Now whats different about this antenna”, he continued. This was apparently the question Seejo was waiting for. This is is all wrong, said Seejo. Antennas are supposed to be parabolic in nature to capture the signal. These antennas don’t make any sense – they just won’t work. The poor guide was speechless. He was trying to get us to see that underneath the antenna, there were words written that spoke of wide open spaces and loving without boundaries. Seejo brushed those lofty feeling aside – but this is technically wrong he insisted. It was at that point, when I steered Seejo away from the Ilya and Emilia exhibit to some lego faces and colorful paintings. We really understood that well. We made several day trips to DC area with my mother to see some of the places that we haven’t had a chance to visit so far. Hillwood Estate and Gardens is the former residence of business woman Marjorie Merrieweather Post-owner of the General Foods (products include Honey bunches of oats, raisin bran , and several other cereals). She was also an avid art collector in the first half of the twentieth century and amassed a wonderful collection of Russian artifacts. Her husband served as the a American ambassador to Soviet Union just before the second world war and during her visits there, she managed to collect and bring back several Russian objects. Her house is now a museum to display her vast collection. Hillwood estate has beautifully decorated rooms with each room displaying part of her collection – including her collection of Faberge eggs, Russian icons. There are rooms that display her dresses and personal artifacts too. But more than the house it’s the gardens that are impressive. Beautifully landscaped, there is a Japanese Garden, a putting green, her very own pet cemetery, greenhouses, a rose garden and a huge lawn that just invites the kids to roll down. There is also a Russian themed Dacha or “vacation cottage” on the estate grounds. The dacha hosted a jewelry collection owned by Post or her daughters that was pretty spectacular. Arlington National Cemetery In the 15 odd years that I have been in DC, I have not managed to visit the Arlington Cemetery. And it was certainly my loss. Arlington Cemetary holds the tombs of more than 400,000 military veterans and their spouses. There is something poignant about seeing rows and rows and rows of tombs of soldiers that have died over the years. Its unimaginable that you can see the sheer number of tombs out in unending rows and not immediately want to stop all wars. Since spouses of military personnel can be buried here, this is an active cemetery and averages about 30 funerals per day. Tombs are divided into many sections — each section holding the remains of soldiers that hav fought in from the civil war to these that perished in the recent conflicts . There are areas devoted to nurses, coast guards, chaplains and so on. The Arlington cemetary is the final resting place and holds the eternal flame memorial for President Kennedy; Jackie Kennedy and their two kids are buried nearby. A very solemn and elaborate changing of the guard ceremony occurs every hour, right between the Tomb of the Unknown Soldier and the very classic outdoor memorial amphitheater. I was surprised to see it here - this was something I thought only occurred in Buckingham palace. The cemetary is large and situated on a hill that it makes sense to use the tram provided by the park authorities (there is an additional fee for that). Another must see point is the panoramic view of Washington DC from behind Arlington House , former home of Robert Lee , the confederate general.